Are Starlings, Mockingbirds, or other large birds causing your mealworm budget to go “through the roof”? 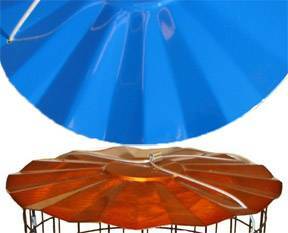 Have you tried other “Starling-proof” feeders for feeding mealworms, but found Bluebirds are reluctant to enter, or become trapped inside the feeder? 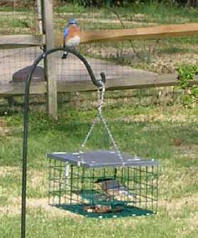 A Starling-resistant Bluebird feeder for Bluebirds and other small songbirds that enjoy mealworms. No natural nesting cavities were harmed in the making of this tree-free design! makes this feeder appropriate for all Bluebirds, everywhere!
. . . Another innovation in Bluebird feeding . . . 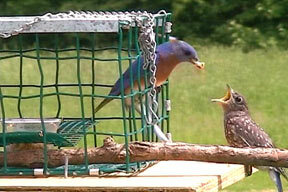 The History: In 2005, we began searching for the “ideal” feeder for feeding mealworms to our Bluebirds. Every design we tried had drawbacks – the ones enclosed in plexiglass tended to make the birds panic when they were inside and couldn’t figure out how to get out. The ones with the domed lids didn’t really exclude the Starlings. Then we found a “cage within a cage” suet feeder that we thought might work if a few modifications were made on it. We contacted the manufacturer, and he made a few changes in his design, and allowed us to purchase and sell his feeders exclusively. A fledgling appears at the feeder for the first time! The male gathers up mealies while the female looks on. 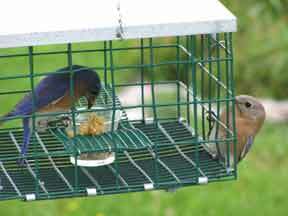 *Several openings in the mesh have been enlarged to ensure that the fattest male Eastern Bluebirds, and larger Mountain Bluebirds can use this feeder, while still excluding Starlings, Mockers, etc. Note: You can make this modification yourself by following the simple instructions below. A red-bellied woodpecker tries his best to steal some of the tasty treats. Photo contributed by Dave Kinneer. 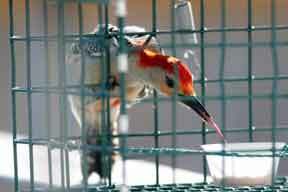 Then, in 2007, we found another “cage within a cage” suet feeder made by Erva Tool in Chicago. 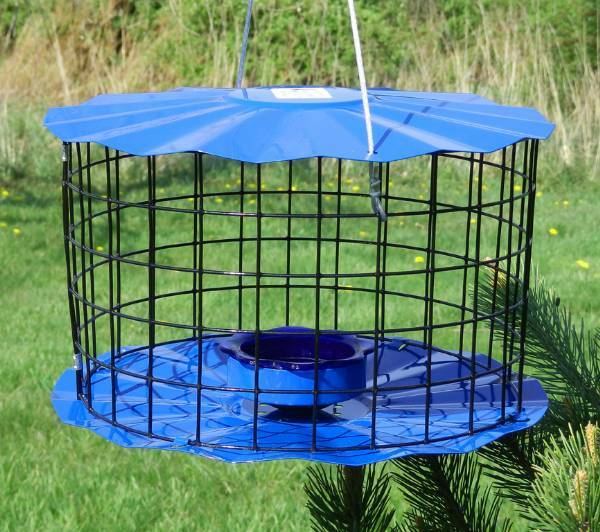 For a year, we purchased first the completely assembled feeders, then later the disassembled parts, and retrofitted these ourselves in our workshop to turn them into the Bluebird Nut Deluxe Mealworm Feeder, which we offered for sale in addition to the original version. The Deluxe feeder become so popular that we eventually halted production on the original feeder. Then in 2008, we were excited to learn that Erva would begin manufacturing a full line of feeders based on the original Suet1 design, including one based on our modifications that turned it into a mealworm feeder! The result was theBBF1, Erva’s version of our brainchild. We think this feeder is simply the best mealworm feeder available anywhere! Click here for purchasing information. A few of our customers have requested instructions for making the Mountain Bluebird Modification on their own Bluebird Nut feeders. 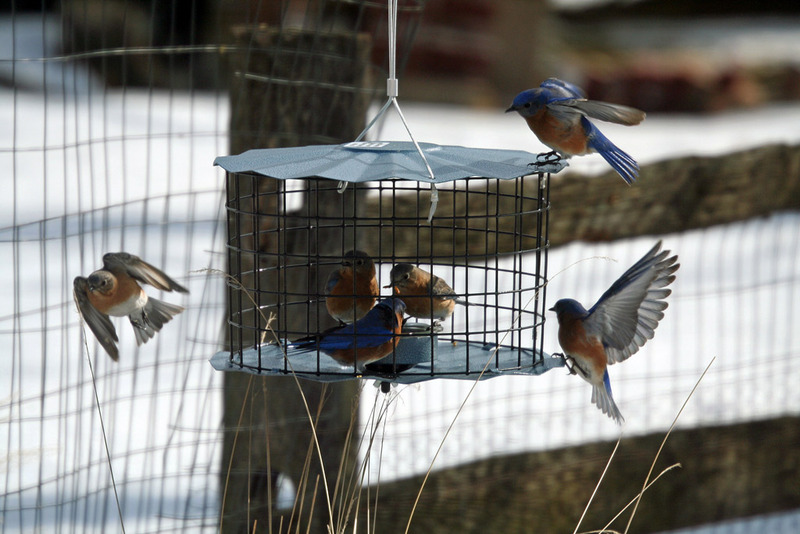 We’ve heard reports of a small number very (shall we say) well-fed Eastern Bluebird males needing this slight tweak to feel comfortable entering and exiting the feeder. Rather than put these boys on a diet, we’re providing here the simple instructions for making your own “Mountain Bluebird Modification” for the benefit of these big boys. A pair of channel-lock pliers opened to its widest setting works very well for this mini-project, although any pliers will do. 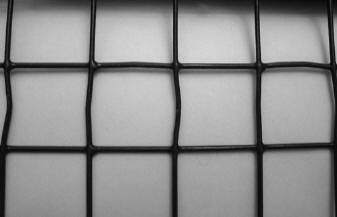 Work carefully to avoid damaging the plastic coating on the mesh. For extra safety, you can pad the teeth of your pliers by slipping a small piece of rubber or plastic tubing over the ends, although if you take your time, it isn’t necessary. 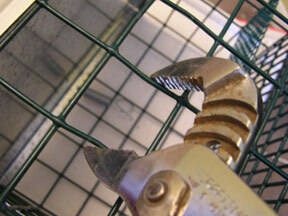 Using the pliers, choose a row of mesh and carefully “pinch” every other opening ever so slightly side to side. (Fig. 1) (If you’ve watched your Blues using the feeder, you’ll probably want to choose the row they most often use to enter and exit the feeder.) This will have the effect of enlarging the in-between openings. You can then use the pliers to slightly open the enlarged openings top to bottom by pinching the openings above and below. Be careful not to go overboard – (Fig 2) you don’t want to make the opening so large that the feeder won’t effectively keep out Starlings! That’s it! It doesn’t cost a dime, and shouldn’t take more than a couple of minutes.